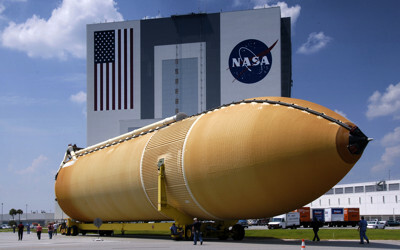 The external fuel tank parked outside the VAB for the Hubble servicing mission, after being unloaded from its barge at the Cape. obscure I know but what the hell - Randy - keep the double entendres to a minimum :-) Image, as usual, prepared for you via Photoshop CS3 and the new tool de jour, Tiffen DFX. Do they get a discount if they pay cash when they fill'er up?? That is one mammoth tank!! I like it against the building!! The environmental aspect you mentioned right above is a very interesting fact. We wanna explore other planets / places, yet, don’t know how to take care of our own so it seems. What I like about this, in all seriousness, is the demonstrated scale. Having the people milling around this thing gives a great perception as to the size of it. Tiffen DFX is a really nice, if expensive toy. Nice clean-up, as usual. Please, even if you don't visit my gallery, check out my "Faves".I've left them intact since day "1", and would like it if every image there got the attention they deserved.